Place tomatoes, meatballs, spaghetti, Italian seasoning, onion powder, garlic salt and chili powdered together in a large pot. Add water and broth. Cover and bring to a boil, stirring every 1-2 minutes. Cook for 14-16 minutes, or until pasta is tender. Remove from heat and garnish with parmesan and basil. Serve hot. Enjoy! If you’d like more liquid in your soup, add additional tomatoes, broth and water to taste. If you love one-pot pasta or soup (or one-pot pasta AND soup), break out the pot! Because this easy weeknight dinner is about to revolutionize your life. All of your favorite Italian flavors, served in a whole new way. This soup is a great dish for kids, and warm and comforting on a chilly winter night. 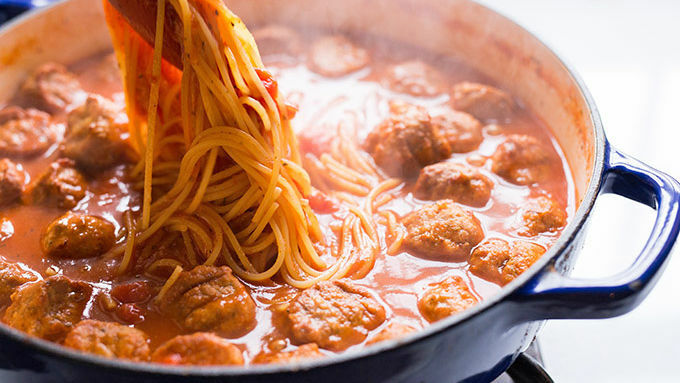 Spaghetti and meatballs join forces in a rich soup, complete with the flavors of marinara sauce. All in one pot. All in less than 20 minutes. On busy nights, when you’re too tired to cook, this is a perfect meal to pull out. All of the items can keep in the pantry or freezer. So you can always have everything on hand for those moments when a 20-minute meal is all you have time to cook. Added bonus: everyone LOVES this dish, so there won’t be a smidge of complaining when you carry a steaming pot of Spaghetti and Meatball Soup to the table. (Win-win, we say.) Happy eating! If you love one-pot pasta or soup (or one-pot pasta AND soup), break out the pot! Because this easy weeknight dinner is about to revolutionize your life. All of your favorite Italian flavors, served in a whole new way. This soup is a great dish for kids, and warm and comforting on a chilly winter night. 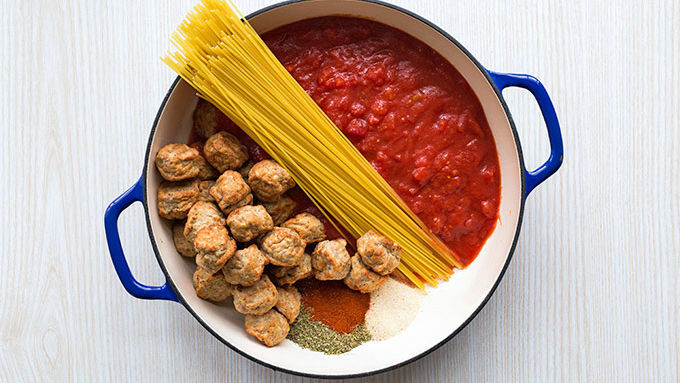 Spaghetti and meatballs join forces in a rich soup, complete with the flavors of marinara sauce. All in one pot. All in less than 20 minutes. On busy nights, when you’re too tired to cook, this is a perfect meal to pull out. All of the items can keep in the pantry or freezer. So you can always have everything on hand for those moments when a 20-minute meal is all you have time to cook. 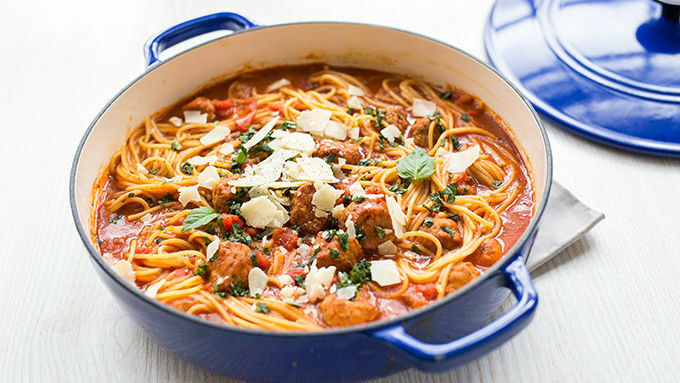 Added bonus: everyone LOVES this dish, so there won’t be a smidge of complaining when you carry a steaming pot of Spaghetti and Meatball Soup to the table. (Win-win, we say.) Happy eating!